The first half was all Broncos, with a C.J. Anderson touchdown run and a touchdown pass from Trevor Siemian to Jordan Taylor bracketing two Brandon McManus field goals. C.J. Beathard got the 49ers on the board with a touchdown pass to TE George Kittle, but the 49ers would fall to the Broncos 33-14. With that we give you our PFF exclusive takeaways from the contest for each team. When Siemian came on late in the second quarter, the offense seemed to catch rhythm as he was efficient throughout his 24 snaps. He showed poise under pressure, completing 5-of-7 passes for 63 yards and a touchdown. 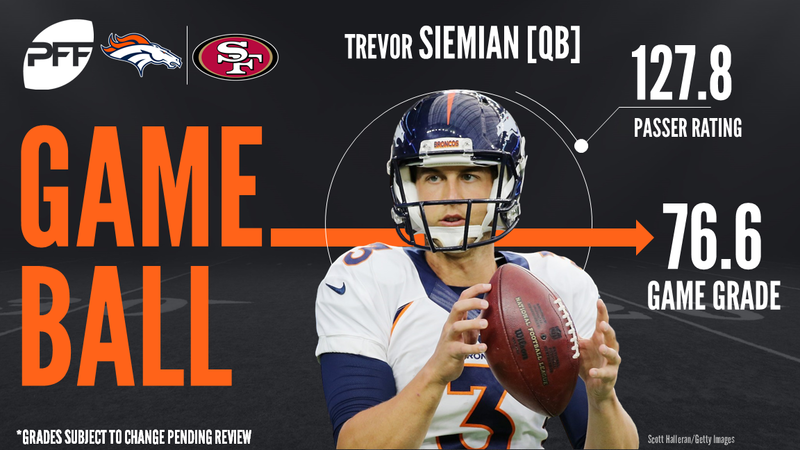 Siemian did most of his damage in the intermediate passing game, going 6-of-6 for 76 yards. Leary was the Broncos highest graded offensive player and Denver will be hoping the free agent acquisition can bring some stability to the offensive line. He impressed as a run blocker recording a grade of 88.9 while only allowing one hurry on his way to a pass blocking efficiency of 96.7. The fourth-year defensive tackle put together his second straight dominant preseason performance Saturday night. He may not have had a tackle on the stat sheet, but he had a batted pass, won multiple reps as a pass-rusher, and affected a handful of runs. The second-year safety/linebacker hybrid showed his multi-faceted skill set off against the 49ers. He was targeted five times on the day and only yielded 20 yards on those targets with a long reception of only seven yards. While the stat line looked great at the end of the game, Beathard benefited from half of his 110 passing yards coming after the catch. He also missed his mark on easy throws a handful of times in an up and down performance. For the most part, Kittle’s 22 snaps were fairly uneventful. On one routine shallow crossing route right after halftime though that all changed. He blistered down the sideline and bowled over a Denver defensive back en route to a 29-yard touchdown in one of the most impressive singular displays from a tight end this preseason. Reid showed his potential as he was all over the field during his 22 snaps. He recorded three stops and only allowed 11 yards receiving on three receptions. UDFA safety Lorenzo Jerome made the most of his opportunity against the Broncos. His 86.5 coverage grade was tops on the team, allowing only one reception which was limited to three yards while recording a pass break up.